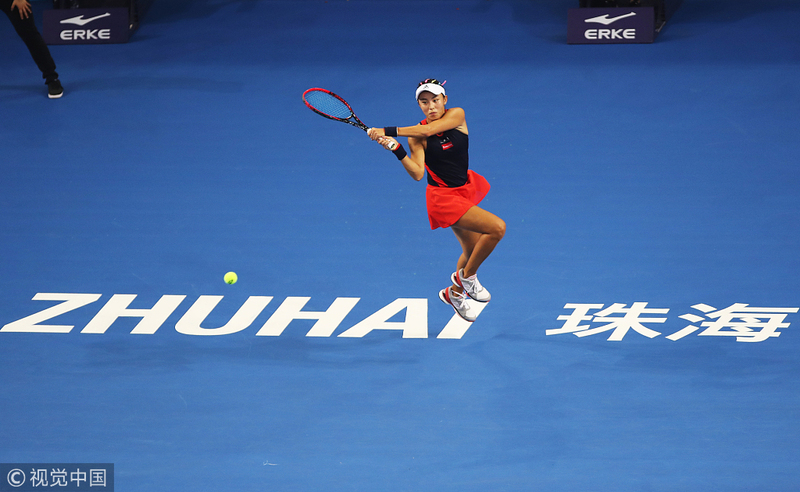 Chinese ace Wang Qiang has set her sights on filling some big shoes. In a country where tennis success is measured against two-time Grand Slam champion Li Na, Wang's impressive late-season surge has shown she could emulate China's greatest player and lone major winner. Wang rounded off her campaign with a run to the final of last week's WTA Elite Trophy Zhuhai, where she lost in straight sets to Australia's Ashleigh Barty. The deep run lifted Wang to a career-high world ranking of No 20, with the 26-year-old becoming the fourth Chinese to breach the top 20 after Li, 2008 Wimbledon semifinalist Zheng Jie and 2014 US Open semifinalist Peng Shuai. It also marks the first time since Li retired in 2014 that a Chinese player has ended the year in that bracket. Wang's excellent second half to the season also included her second WTA title in Guangzhou, semifinal finishes in Hiroshima, Wuhan and Beijing and another final in Hong Kong. Her 71-place ascent in the rankings since May has seen her beat eight top-20 opponents along the way. "I've long believed that I belong in the world's top group as I am now," said the Tianjin native. "The breakthrough performances late this year have combined to consolidate my self-belief to a point where I am now confident enough to face anyone at any level." Wang originally failed to qualify for the Zhuhai semis from her round-robin group and had booked a flight to Malaysia to go on vacation. However, when Madison Keys withdrew due to injury, Wang earned a reprieve and made it count in emphatic style, thrashing Spain's former world No 1 Garbine Muguruza 6-2, 6-0. It was Wang's second straight win over the 2016 French Open and 2017 Wimbledon champion after a three-set semi victory in Hong Kong. Muguruza said Wang's performance was "excellent", adding: "She's playing great tennis this year and she's on fire." Barty, who has risen to a career-high No 15 in the world, also heaped praise on Wang. "She's extremely solid off both wings," said the 22-year-old. "She makes you work extremely hard. You know you're always in for a very tough, physical battle. And she makes you work for every single point, no matter what the score is." Wang hopes bigger things await next year. "To reach the semifinals at the Grand Slams is a great accomplishment, while I haven't gone to the second week yet," she said. "That's what I have to aim for. I will chase after the legendary Li and Zheng as hard as possible. I believe I can make it there sooner than expected." Having a player from the world's most populous nation back among the women's elite is good news for the WTA, and the tour's CEO Steve Simon was impressed by what he saw in Zhuhai. "She really has the chance to be a top-10 player," Simon said before Sunday's final. "You can see the refinement of her game coming. This week shows she's learning to compete. She started poorly in some matches, then worked her way back to win them. "No question that Wang's performance will help inspire more investment and more young players. "There's a lot of really talented young junior Chinese players coming through the system inspired by the examples like Wang. I think it's very exciting."